While Angelenos are prone to resorting to every sugar alternative under the sun (agave syrup, anyone? ), there’s always a cheat day. Of course, a delicious chocolate chip cookie or a simple cupcake is a nice, quick sugar fix, but we also love an unconventional spin on classic flavors. Thankfully, some of our best local pastry chefs are taking dessert beyond expectation. Here are some favorites. MB Post offers a reinvention of a usually dull dessert associated with school cafeterias with The Elvis. 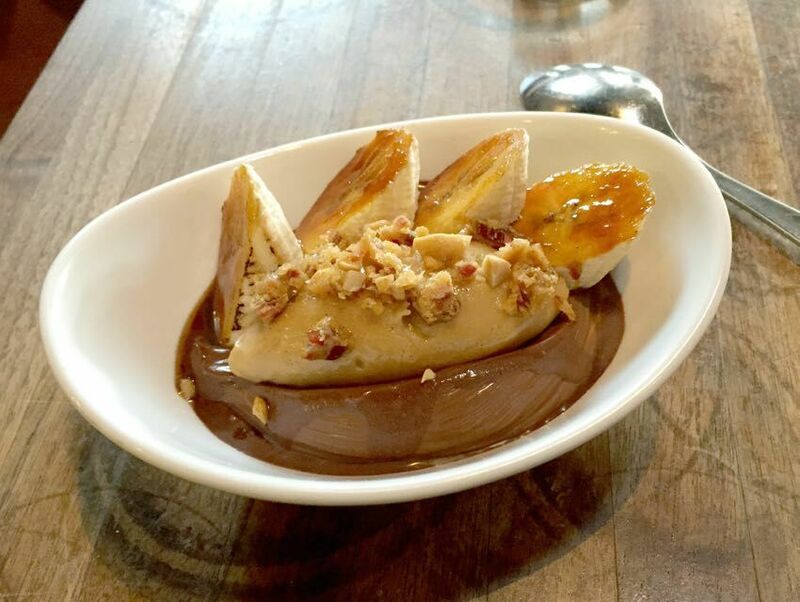 Bringing considerable oomph to the chocolate pudding concept, the dessert combines everything the King and you will love swirled into one bite—chocolate pudding and peanut butter mousse with a fine sprinkling of bacon brittle and coins of carmelized banana slices. “We’re always looking for nostalgic flavors and dishes that tell a story. [For this dessert] I thought back to the Elvis sandwiches that my brother liked as a kid,” says head chef and owner David LeFevre. While I’m still mourning Jin Patisserie’s departure from Abbot Kinney Boulevard, pastry chef and owner Kristy Choo continues to bring great delicacy and skill to her creations out in Culver City—especially with her Rouge cake. Choo combines the heady bergamot essence of Earl Grey with dark chocolate Guanaja ganache and a layer of crème brulee, mounting them on a scant foundation of chocolate sponge. This all-in-one sumptuous little package makes a perfect third course for any glam dinner party. If you can’t make the trek to Choo’s Culver City commercial/retail kitchen, keep an eye out for her exquisite high-tea pop-ups. Cake Monkey won my heart forever with its gourmet version of Hostess Ring Dings. The chocolate brown butter cake sandwich is filled with Tahitian vanilla cream and Valrhona Crunchy Pearls, then coated in bittersweet 58 percent Belgian chocolate. The inspiration came from co-owner Lisa Olin’s childhood. “I wanted to offer the upscale version with all-natural, high-quality ingredients. My partner [and pastry chef], Elizabeth Belkin, had the great idea to add chocolate Crunchy Pearls for a little texture,” says Olin. While the pair hope to open a brick-and-mortar in Mid-City this summer, you can currently find their desserts at various cafes, some Umami Burger locations, and Pizza Rev. You can also order the treats from their commercial kitchen.